With the low price of oil and the federal government's ban on oil and gas leases in the Arctic, will the $300-million 'road to resources' pay off? With oil prices dropping and a ban on Arctic drilling, will the so-called 'road to resources' pay off? What governments touted as a 'road to resources' on the Northwest Territories' Arctic coast has become a nation-building exercise, as the dreams for an oil and gas boom fade. 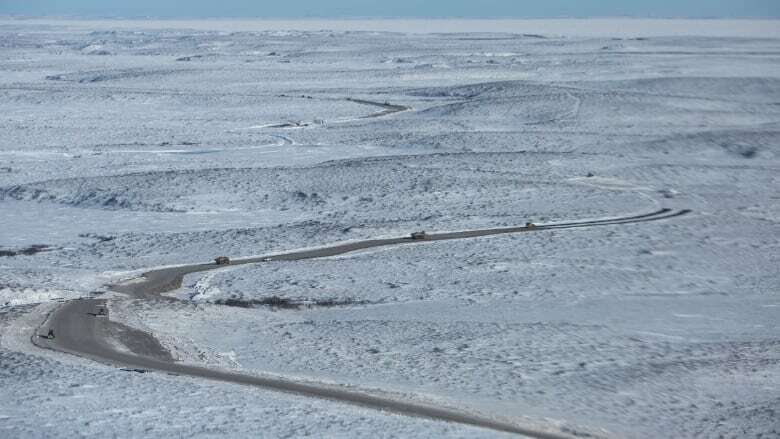 Almost a decade ago, the territorial government said the $300-million project to build an all-weather road to the isolated community of Tuktoyaktuk would make exploration for oil and gas in the region more efficient and therefore more profitable. 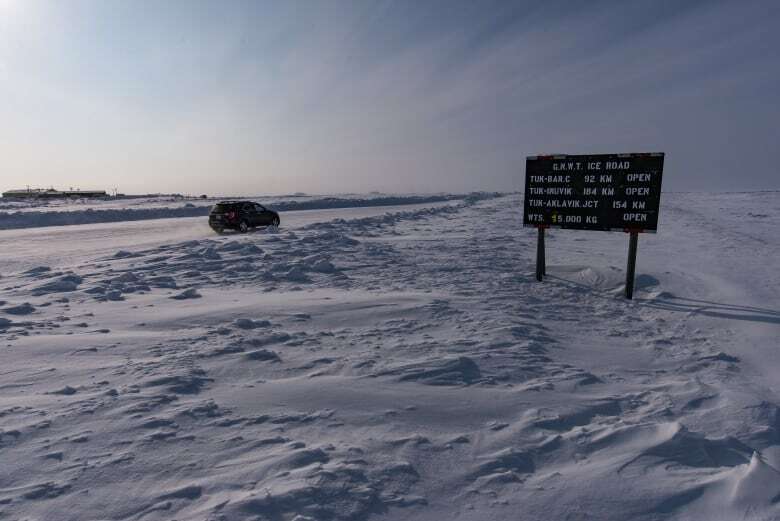 The territorial government coughed up $99 million, in addition to $200 million in federal dollars, to connect the town of Inuvik to Tuktoyaktuk, population 900, with the 137-kilometre road. While there was an ice road for four months every winter, in the warmer months, the only way in and out of Tuk was by plane. 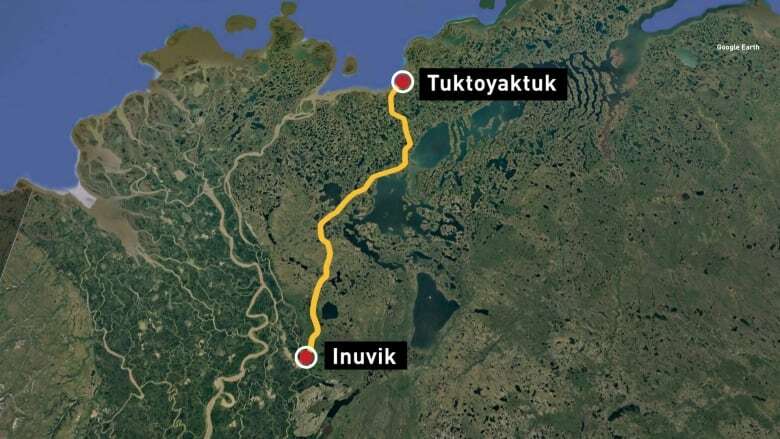 Now, after four years of construction, the Inuvik-Tuktoyaktuk Highway, is finally set to open this week. But with a moratorium on oil and gas development in the Arctic for the foreseeable future, will the road be worth its hefty price tag? Previously, the only way to get between Tuktoyaktuk and Inuvik over land was by ice road four months a year. For decades, Tuktoyaktuk has been a community grasping for the trickle-down spending of oil and gas companies — only to have the plummeting price of oil and the federal government destroy that hope. The Mackenzie Delta region and its offshore extension represents what petroleum geologist Scott Montgomery calls a "giant to super-giant, completely untapped petroleum province." Montgomery, with the University of Washington, estimates that there are between 14.5 to 20 billion recoverable barrels of oil in the region. He calculates that it could be up to a $1.5-trillion resource. Giving industry better, less expensive access to that resource was originally what made the $300-million highway cost-effective. But then the price of oil dropped, and companies that hold offshore leases in the Beaufort Sea, like BP, Imperial Oil Canada and Exxon Mobil, began to slow down exploration. Then Prime Minister Justin Trudeau and former US President Barack Obama put the final nail in the coffin — a five year moratorium on offshore drilling leases in Arctic waters. 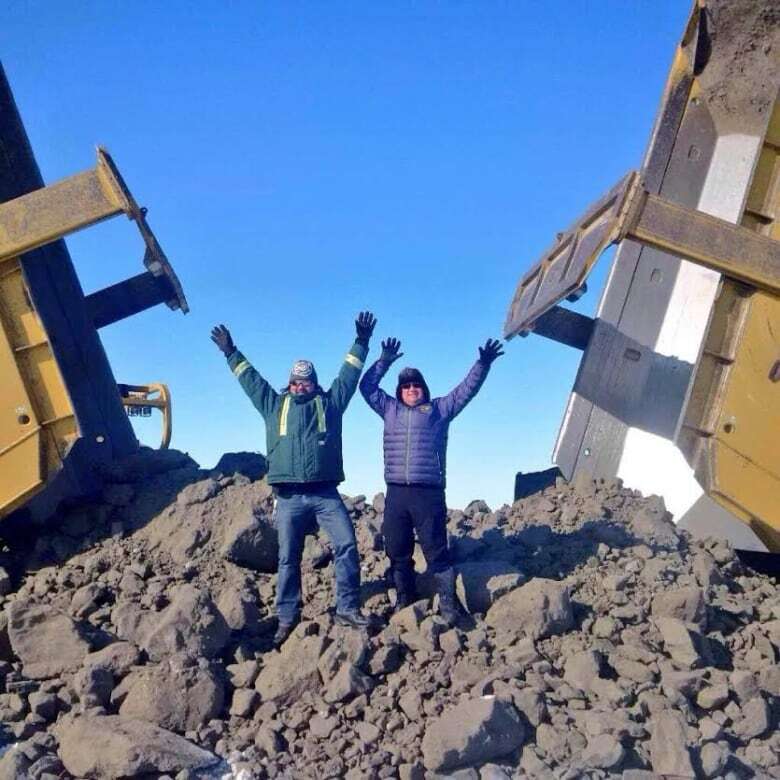 While many Indigenous and environmental groups celebrated, the Inuvialuit community of Tuktoyaktuk saw its hope as being the oil and gas capital of the North crash and burn. "After this road is built we have nothing, nothing happening here," the former mayor of Tuktoyaktuk, Merven Gruben, told the CBC. "We have to drum up some work and make things happen here. We sit and wait, nothing's going to happen. We have to go out and chase it just like we did this road." But according to Montgomery, as the price of oil begins to rebound, there is hope for the community's economy — just not in the Beaufort Sea. "What I don't see is Mr. Trudeau opening up drilling [in the Beaufort Sea] anytime soon," he said. Montgomery says the community's saving grace could be the Mackenzie Gas Project — also known as the Mackenzie Valley pipeline. If it ever happens, the proposed project would transport natural gas about 1,200 kilometres from fields in the Mackenzie Delta near Tuktoyaktuk, along the Mackenzie River Valley to northern Alberta. The pipeline was sanctioned by the National Energy Board on the condition that construction begin by the end of 2015, but that deadline has been extended to 2022. Imperial Oil refused to comment on whether or not the Tuk road makes building a pipeline more attractive. But Montgomery believes a pipeline will happen one day, now that a road to the massive natural gas fields exists. "That's a pipeline whose time will most likely come," he said. 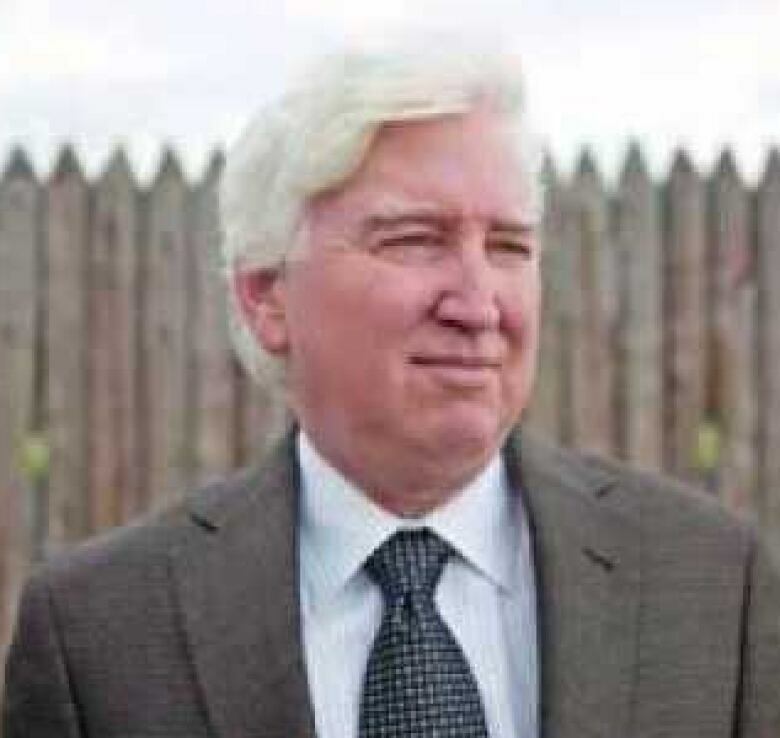 But not if you're talking to oil and gas analyst Bill Gallagher. "This is all a pipe dream," Gallagher said. "If [the highway] was hoping to restore the lustre of oil and gas riches — that's just way in the past. That's not going to happen. It is a bitter pill if you'd hoped this would pay off in spades." Gallagher believes there is no future for oil and gas in the Northwest Territories. "The Delta and the Beaufort Sea have fallen off of everyone's radar screen. The economics of the industry and the priorities of the industry have turned around," he said. Gallagher said N.W.T. Premier Bob McLeod's recently issued "red alert," was in vain. McLeod criticized the prime minister's decision to place the five-year ban on drilling in the Arctic without consulting northern leaders and said the future of the territory is in jeopardy. 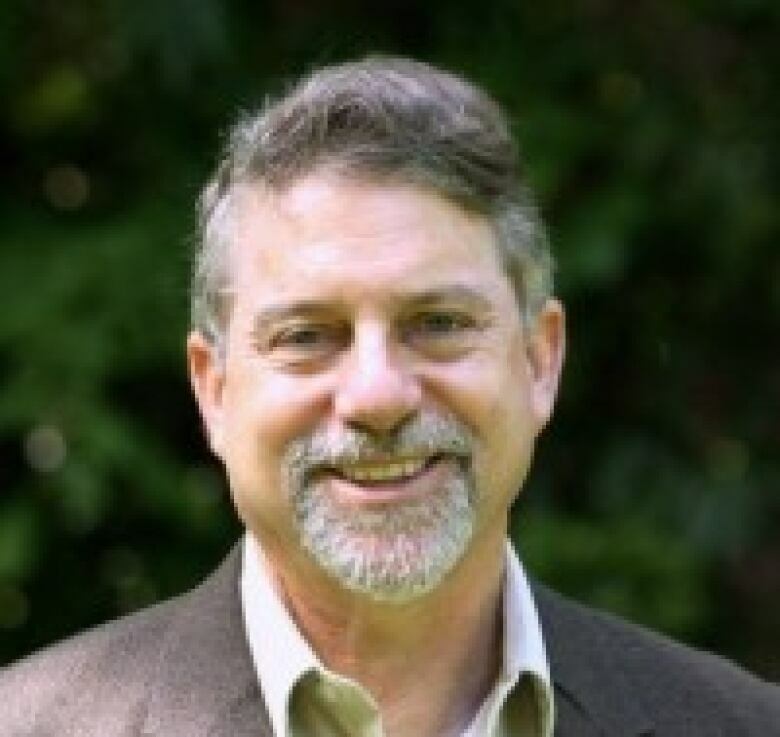 "[McLeod] got a rough ride politicking his message around town. There's just no interest and no uptake on a predicament that has been a long time coming," Gallagher said. Gallagher says one of the North's biggest problems is an overzealous regulatory regime that has spent more money on regulatory boards than on actual development. "North of 60, in my view, has been turned into a northern field park. The eco-activist, Inuit and First Nation agenda prevails," Gallagher said. "That could be a good thing. But if you're looking for infrastructure — whether it's roads, pipelines or drilling programs — none of that's going to happen, not even in the foreseeable future," he added. "There'll have to be a sea change in world politics to make those stranded assets relevant again." It's clear the federal government doesn't think the North should be hanging its hat on resource development to fuel its economy. That's a predicament, Montgomery said, that puts Tuk between a rock and a hard place. "They are sitting right next to this enormous resource and yet it is a resource whose products the world does have to move away from." The road could also bring social benefits. A report published in 2014 by the N.W.T. Department of Infrastructure predicts more recreational and sporting opportunities for youth and better, less expensive, access to health care and education. The department estimates that with an all-weather road bringing food, goods and fuel north, the cost of living in Tuktoyaktuk will decrease by about $1.5 million a year. But locals have raised concerns that it could also bring more drugs and alcohol to the community, which has restrictions on liquor and a problem with bootleggers. That $300 million could also have gone a long way to improve the quality of life for residents in the region. A recent report released by the Senate Committee on Aboriginal Peoples looking at housing in Inuit communities found that Inuvialuit communities —Tuktoyaktuk, Paulatuk, Ulukhaktok and Sachs Harbour — are in desperate need of affordable and public housing. The committee says that combined, those four communities need an additional 107 housing units to reduce overcrowding and homelessness. Those units come at a cost of about $300,000 to $400,000, meaning the federal and territorial governments could adequately house every Inuvialuit person in the region for a total of $37.5 million. On the plus side, the potential for more tourists who want to see the Arctic Ocean could affect jobs and the community's economy. Throughout the territory, the tourism industry has already grown exponentially in the last five years. In 2016, more than 108,000 people visited the N.W.T and spent about $200 million. The territorial government says the road may help the community of Tuktoyaktuk get a cut of that spending. It estimates the road will boost tourism to the territory by $2.7 million and could create 22 additional full time jobs. The road obviously creates more opportunities for carbon-emitting vehicles. 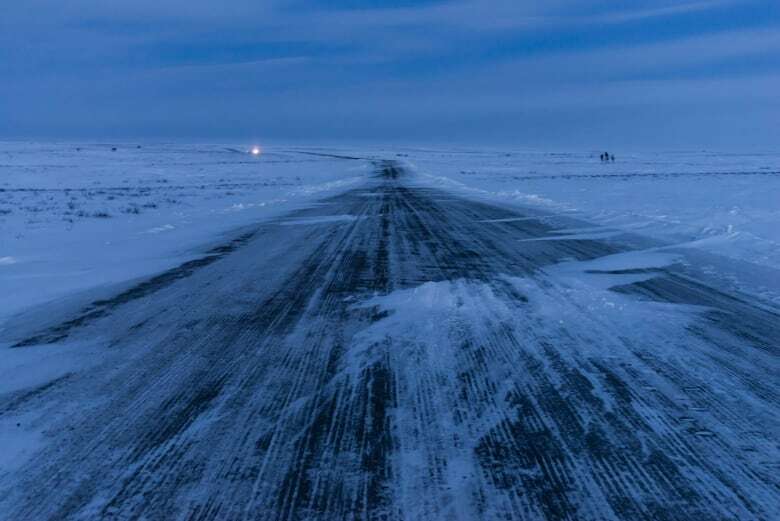 During the roughly four months the Inuvik to Tuktoyaktuk ice road has operated each year, the territorial government estimates that vehicle traffic emits about 1,000 tonnes of C02 annually. The territorial government expects emissions from 60 to 175 commercial and personal vehicles a day to triple that number. But those emissions should be offset by more than 60 per cent, as the number of flights between the two communities decreases. The Department of Infrastructure estimates future maintenance on the road will cost about $12,000 to $15,000 per kilometre, which adds up to about $1.5 million to $1.9 million per year. It's been constructed on a bed of gravel that is two metres thick in some places to guard against melting and moving permafrost, which goes down hundreds of metres. The territorial government says the new road will save $560,000 a year by not having to build and maintain a winter road between the two communities. The government says the road may affect wildlife "to varying degrees, depending on the species." It says the Infrastructure Department has done studies to ensure minimal harm on habitat. "However, indirect effects from hunting and trapping or increased predation by carnivores, or direct effects from wildlife-vehicle collisions may occur," the road's website says. Gruben, the former mayor, says the highway will be worth it, in the end. He says it will help Canada protect the Northwest Passage, and he's pushing for the Coast Guard to develop a bigger presence in the community. "With more and more traffic coming through, Tuk is right at the door step of everything. "What better place than to watch right from there?"